Providence Public Library is a member of the statewide Ocean State Libraries (OSL), formerly CLAN (Cooperating Libraries Automated Network), which links over 70 public libraries in Rhode Island. OSL cards may be used at other Ocean State Libraries libraries to borrow materials. You are responsible for your OSL card and it is not transferable. LIBRARY POLICIES may vary at each OSL library. Members of Ocean State Libraries reserve the right to deny check-out privileges to anyone who has overdue library material from any OSL library, or owes fines of more than $5 at any OSL library. Each library may also determine charges for lost or damaged material. Lost cards will be replaced for $1. You should inquire about specific circulation policies when using a different library. You may borrow up to 99 Providence Public Library items at one time. All 3-week loans may be renewed once. Renew in person, online through your account, by calling 401-455-8000, or our automated system at 401-736-0965 or 1-800-359-3090. Maximum fine on books is $6 and on DVDs is $10. Fees for lost items is dependent on the cost for the item. Temporary cards: Borrowing limit is 2 items. Providence Children’s Museum passes are available. Ask in our Children’s Library or call 455-8025 or 455-8098. All materials (except WiFi hotspots) may be returned to any Ocean State Libraries library. Providence Public Library disclaims responsibility for damages incurred to the borrower’s equipment from use with the Library’s audio-visual materials. The PPL Computer Lab is self-service. It is walk-in, on first-come, first-served basis. You must have a Library card to use computers. Library cards are FREE and issued at the Circulation Desk with proper ID. Blue screen computers have 2-hour time limit. Red screen computers have a 15-minute time limit. Guest passes may be obtained if you do not have a Library card. If all computers are used, check for the next available at the Reservation Station. B/W Prints are ¢.10 and Color Prints are ¢.25. If you leave your computer, click the lock button on the timer box. Failure to do so may result in the loss of your computer. Only one person per computer except accompanied by children. No cell phone use allowed in lab. Children under 14 must have parental permission to use computers. You may listen to your headphones as long as they do not disrupt others. The use of another’s Library card will result in the termination of your session. Viewing of inappropriate material will result in the termination of your session and could result in ban from Library use. Computers will automatically shut down 15 minutes prior to Library closing. Providence Public Library is required by law to filter Internet access in compliance with the Children’s Internet Protection Act. If your access is blocked and you are at least 18 years of age, you may ask the Lab staff to temporarily unblock a Library-friendly Website. Providence Public Library is a member of Ocean State Libraries, a consortium consisting of public libraries throughout Rhode Island. (A list and map of OSL member libraries can be found here: https://www.oslri.org/libraries/.) A library card from any OSL member library allows you to borrow materials from and return materials to any OSL member library. Requests for materials from other OSL libraries are known as “holds”. Holds can be made from the OSL catalog (http://catalog.oslri.net/) or with library staff and delivered to any OSL library of your choosing. PPL extends full access and borrowing privileges without charge to all Rhode Island residents. ILL requests cannot be made for titles less than 6 months old, or for rare or unique items. ILL requests for CDs and DVDs can only be made for items owned by a Massachusetts library that is part of the Minuteman Library or Old Colony Network. 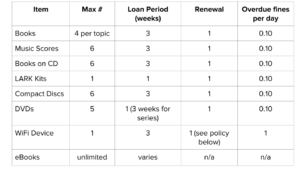 ILL loan periods are determined by the library lending the item and ILL items cannot be renewed for more time. ILL items must be checked out from and returned to PPL staff during hours of operation. The borrower is responsible for any fees associated with the loss, damage, or lateness of items returned elsewhere. Requesting patrons must check ILL items out on their own library card, not any other person’s. Up to 5 ILL items can be requested at the same time. ILL Lending Policy: All Providence Public Library circulating items, with the exception of special equipment and kits, are available for Interlibrary Loan requests. Information about other library services and about PPL can be found on the Library’s website: https://www.provlib.org/. As a user of Providence Public Library’s access to the Internet, I understand and will abide by the policy and guidelines below. I agree to the conditions below and wish to proceed. In response to the advances in technology and the changing nature of information delivery, Providence Public Library is pleased to offer public access to the Internet. The Internet is a worldwide network of computers. It is a constantly expanding resource which allows the Library to access information from outside its collection. Most of the information available on the Internet is useful, entertaining, and enriching for individuals of all ages. The Internet contains a wide variety of resources representing many points of view. The Internet is a global electronic network. Providence Public Library has no control over its contents, nor does the Library have complete knowledge of everything on the Internet. Since there is no external monitoring, users may find some material on the Internet that is unreliable, offensive, disturbing, or illegal. Providence Public Library does not guarantee the accuracy of the information users might obtain through the Internet. Providence Public Library believes that the benefits of Internet access far exceed any disadvantages. Librarians have recommended starting points for specific subject searches that are appropriate to the Library's mission and services. Access to the Internet is provided equally to all patrons, compatible with the Library's Mission Statement and Rules of Conduct. Internet users must accept responsibility for determining the value of the information they find. Users are warned that the Internet is not a secure medium. Security in an electronic environment cannot be fully guaranteed. All files, transactions, and communications are vulnerable to third party access and therefore should be considered public. Public Internet use at the Providence Public Library will be managed in a manner consistent with the purpose for which it was provided. Time limits may be imposed as necessary to allow the maximum amount of users access to the available workstations. Respect the sensibilities of others. Since Internet access is in the public area, the viewing of obscene materials is not appropriate. Failure to use the Internet responsibly in the public setting of the Library may result in the termination of a user's Internet session. Use the Internet Access Computers in a manner that does not disrupt the orderly function of the Library. Not attempt to modify or disrupt existing, programs, files, passwords, or data. Follow existing copyright rules, software license restrictions, and Internet regulations. Parents are encouraged to share the exploration of the Internet with their children. To assist parents and educators, the Library has created Kids Pages which provide content and links to other sites that users may find appropriate for their children. For more information about the Internet and its resources, see Child Safety on the Information Highway. The Library recommends that parents review this document with their children. Ultimately, as with other library materials, a child's access to the Internet is the responsibility of the parent. Providence Public Library requires that any child under the age of 14 must receive parental permission to access the Internet at the Library. Parents/ Guardians of any child under age 14 must come into the Library to sign a Parental Permission Agreement. Library staff are happy to get you started with the basic navigation of the Internet, but cannot perform individual searches or give detailed individual instruction. However, you may consult our Computer Class Schedule for special sessions on learning more about the Internet. Enjoy searching the World Wide Web! Please remember that librarians are here to help you find the specific information you need, whether it is in our fine collection of books, periodicals, databases, or on the World Wide Web. As a user of PPL's access to the Internet, I understand and will abide by the above policy and guidelines. Providence Public Library provides public library services to all residents of the state Rhode Island. In order to preserve a suitable environment for providing library services we require that users of Providence Public Library facilities be actively engaged in using the Library, that they not impede others in their use of the Library, and that they not interfere with the operation of the Library. To maintain an atmosphere appropriate for reading, writing, research and study, and promote the effective delivery of services to all potential users, the Library Board of Trustees has adopted the following rules of conduct. Eating and drinking are not allowed in public areas. Smoking is prohibited in all public areas of the library. Disruptive, disorderly, or threatening behavior is prohibited. Removing, damaging, defacing or destroying library materials, equipment, furniture, buildings or property is against the law and will be reported to the police. Patrons whose odor impairs the ability of other users to use the library may be required to leave the Library. Soliciting, or distributing leaflets on library property is prohibited. Individuals who wish to distribute materials through the Library, or to place materials through the Library, or to place notices on Library bulletin boards should contact the Public Relations Department. Sexual and/or personal harassment is prohibited. This includes making unsolicited and/or unwanted advances, making lewd or suggestive comments, touching, and staring. Possession of weapons of any type is prohibited on Library property. Altering computer programs, memory, or configuration on any library computer is strictly prohibited. This includes attempting to modify or gain access to system files, passwords, data, and system or network files. Library patrons are obliged to abide by the decision of library staff regarding the use of library equipment and computers. Only software or data authorized by Library staff may be used. Library rest rooms are to be used for their intended purposes only. Bathing and washing clothes in Library rest rooms are not permitted. Appropriate attire must be worn. Shirts and shoes are required. Any person who violates these rules may be asked to leave the Library, and/or may have restrictions placed on their use of library materials. Repeat offenders may have their access to the Library limited for a period of time. Individuals who habitually violate these rules or who threaten or endanger library patrons and/or staff may be physically banned from the Library. Professional photography/videography in or of the Providence Public Library (PPL) requires permission from a member of authorized Library staff. This includes personal/special occasion photography involving equipment such as lighting, tripods., etc. Staff members who may grant permission to an individual or community group to photograph/video either the building or activities taking place within include: Marketing Director, Facilities Manager, Head of Security or Associate Director. The Library recommends individuals or organizations granted permission to take photographs or video in/of the Library to obtain verbal or written agreement from any Library patrons whose images may be recorded on Library premises by those people or organizations for their use, depending on the intended use of the photography/video. Casual amateur photography by patrons and visitors is permitted in the Library as long as additional equipment such as lighting, etc. is not used. As necessary for the positive promotion of PPL in its community and to supporters, the Library actively utilizes photo/video images of its patrons in publications, productions, presentations/displays, social media and on the Web. Please notify a staff member if you do not want us to photograph or videotape you or any child in your care. The Library does not require members of the media to obtain a signed agreement from library patrons who may be photographed or videotaped during a public event held at the Library. Generally, the media does obtain identification from individuals whose images are recorded, as well as verbal agreement during the process, primarily for identification purposes. Thank you for visiting Providence Public Library's Web site. We are committed to preserving the privacy of our visitors and patrons. When you visit the Library's Web site, we collect and store only information to measure the number of visitors to different pages of our site to assist us in making our site more useful to you. This information does not identify individual visitors. We may ask visitors to our site to provide their e-mail address, postal address and/or telephone number only when needed to assist in answering reference questions, participating in a contest, or shipping requested materials. You may give us your email address for the purpose of notifying you about your library account. Providence Public Library will not sell, lease, or disclose your e-mail address, postal address, phone number, borrower records or other personal information for non-library purposes to outside parties unless required by state or federal laws. In accordance with the Children's Online Privacy Protection Act (COPPA), the Providence Public Library website does not collect or store any personal information, even in aggregate, about children under the age of 13. We will never disclose a child's personal information as full name, address, etc. ("information that would facilitate or enable the physical or online locating and contacting of a specific individual") without written approval from a parent or legal guardian. In accordance COPPA we will only display a child's first name, last initial, location and/or age on our pages to announce contest winners and display user-submitted comments. Some of the Library web pages contain links to external sites not maintained by the Library. The Library cannot be responsible for your privacy when you disclose information to outside web sites. It is your responsibility to protect your personal information. In order to further protect your information, always sign off and close the browser when finished using a shared or public computer. You should consider all forms of direct electronic communications (e.g. email, chat rooms) to be vulnerable to third party access. You should always use these with safety and caution. Some of our electronic subscription databases available to you from our web site will require the bar code number from your Library card for authentication purposes. These database vendors do not have access to our records. Your patron records are not associated with this authentication process. Web site data is separate from individual users' library account data. If you have any questions or comments about this privacy statement or our web site, you can contact us at suggestions@provlib.org. The following are guidelines to help ensure that your child’s library time is productive, rewarding, and enjoyable. Parents or guardians are responsible for their children when they visit the public library. Children under six must be supervised by a responsible person who stays with them at all times. As a general rule, this means a caregiver old enough to take full responsibility for a child. Libraries should not replace daycare provisions for very young children. Children are expected to engage in appropriate activities, and if unable to do so, will be asked to leave. Please pick your child up before closing time. The police will be notified if children eleven and younger are not picked up by closing time. Make arrangements with your children so they do not have to call you for rides. Library telephones are for calls concerning library business, and are not for patrons to use except in emergency situations. If your child is coming directly from school, assess whether they need something to eat of some physical outlet first. Explain acceptable and not acceptable behavior to your child. Disruptive behavior may result in being unable to use the library for brief periods of time. Provide your child with a telephone number where you can be reached at all times in case of emergencies. Teach your child how to take care of him/herself in public places, including how to deal with strangers, and what to do if they feel threatened. Providence Public Library welcomes children and young adults and wishes to encourage them to use the Library. The Library is a public facility and responsibility for children and young adults using the Library rests with the parent, guardian, or assigned chaperone. Children who are six years of age or younger must be accompanied by an assigned caregiver who is capable of being responsible for the child and who stays with the child at all times while in the Library. Children who visit the Library with their school, daycare, or any other child care group must be supervised at all times by employees or volunteers of the group. Parents/guardians are responsible for arranging to pick up their children/wards before closing time. The Library cannot take responsibility for ensuring the safety of children left beyond closing hour. In the event children are left unattended at closing, the Library may report the situation to the police or to the Department of Children, Youth, and Families (DCYF). Library users are expected to engage in appropriate activities. Behavior that impairs our ability to provide service cannot be tolerated. Therefore, users who are disruptive or unattended will be asked to leave the library. Unattended child is a child 11 years of age or younger who (a) visits the Library without supervision; or (b) is not picked up at closing time. Young adult is a child 12 to 17 years of age. Assigned caregiver for a child four years of age or younger is someone who is capable of being responsible for the child, with a minimum age of 12. Appropriate activities include: browsing for books, reading, doing homework, writing reports, using computers, thinking, and participating in library programs. Disruptive behavior is any behavior which impinges upon the rights of others to use the Library and includes, but is not limited to, loud boisterous behavior, running, congregating in loud groups, punching, shoving, littering, damaging library property, using foul, abuse or threatening language. Decisions with regard to whether an individual’s behavior is or is not disruptive are the prerogative of the Library. Providence Public Library (PPL) offers facility rentals to community groups, nonprofit (501c3) organizations, private businesses, and government agencies, in accordance with Library policies and State and Federal laws. A Library-sponsored program is one that has been approved by the Library’s Programming Committee, which meets regularly. These programs are meant to provide balanced lifelong learning opportunities to the public that are reflective of the Library’s mission. If you are interested in applying for sponsorship, please identify yourself/your organization and submit your request using our Inquiry Form. Requests should include a biography, program description, references and/or partnering organization, contact information, and a statement about why the program would benefit library patrons, specifically. No unsolicited calls/visits, please. * PLEASE NOTE: For the duration of the Library's current construction project, special occasion photography has been suspended. Anticipated project completion is December 2019. We welcome brides and grooms, newly engaged couples, families, and others to utilize our Grand Marble Staircase to make your memorable photos! Our spaces are available for photos when the Library is open and not otherwise booked for a wedding reception or other event. To inquire about a date, please use the Meeting Space Rental/Reservation Inquiry form. The fee for Wedding Parties renting the Library’s Grand Marble Staircase and Balcony for photos is $200 for one hour. We ask for a non-refundable deposit* of $100 to hold the date with the remainder payable three days before. The fee for Engaged couples or other small parties is $100 for one hour. In addition, if circumstances occur necessitating PPL staff to stay beyond the contracted time, the Library may assess an additional fee. Allowable times are dependent on the Library’s normal open hours.